Remember hearing your parents say that when you left the [barn] door open? It's got nothing to do with this post, and even though I wasn't born in a barn, I lived in one for the past several days. 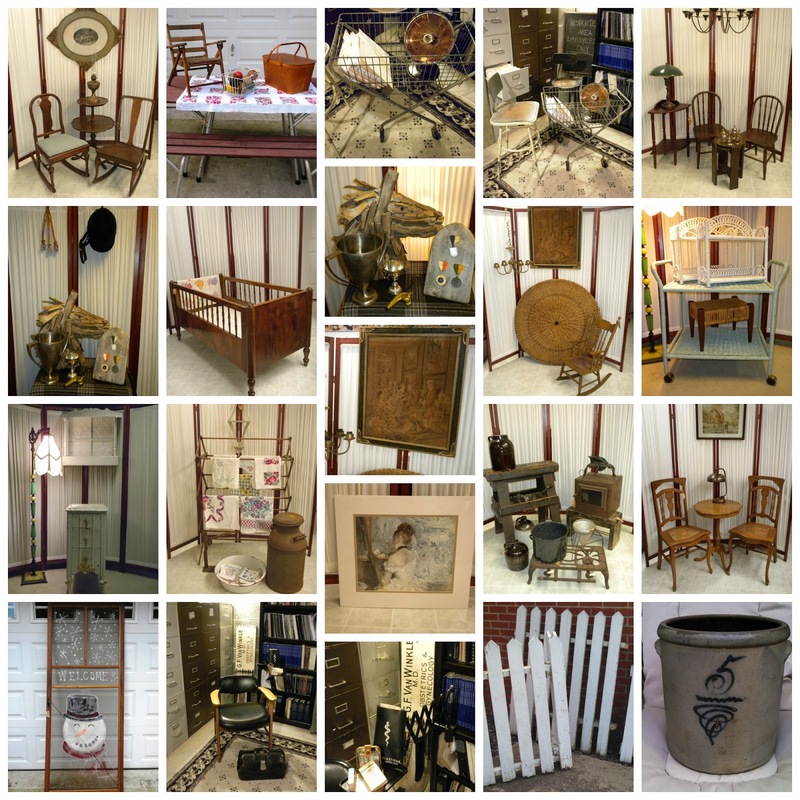 Panoply just checked its first antiques show off its bucket list, and it was a barn sale. This is our review in a nutshell: we likened it to childbirth - you forget the pain once you deliver, until you go and do it again. We want our friends to help us remember that pain if we ever decide to do this again. What we lacked in sales (our success was moderate), we made up for in great new memories made, strengthening established friendships, striking up new friendships, and tucking a few lessons learned in our belts. Lesson #1: Do a sale of this type with friends. When everything else seems to be going wrong, at least you've got your friends. It's hectic loading in and breaking down - things break, things don't sell. As long as you have your friends, you have someone to commiserate with. If it weren't for my sisters, there'd be no Panoply. 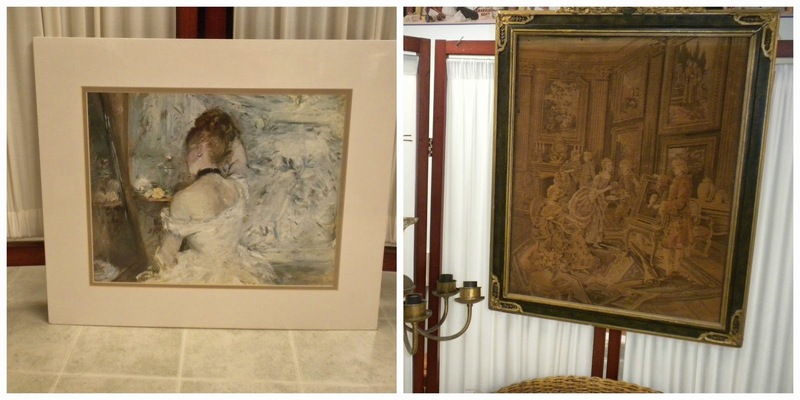 If it weren't for our friends at the antique mall, we wouldn't have done this sale. If it weren't for a close family friend, we wouldn't have had ease in transport. We get by with a little lot of help from our friends. 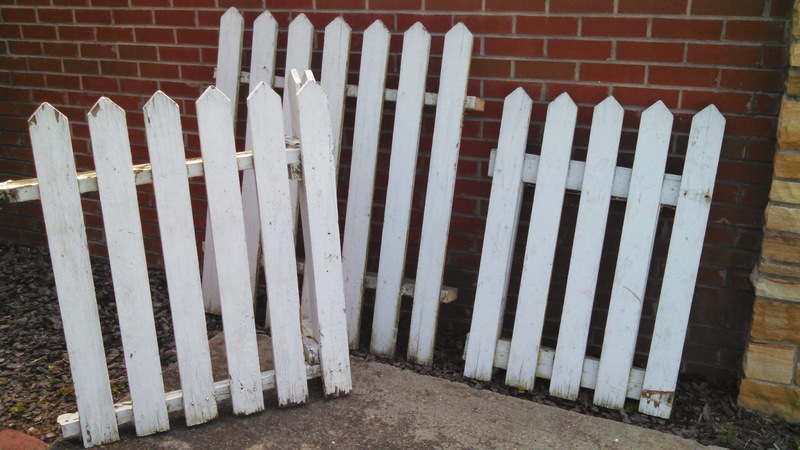 Lesson #2: Everybody wants a good deal, and that includes sellers. We had some terrific stuff for sale, and we had lower than antique mall prices on our items, but this wasn't a flea market. We have a renewed respect for those people who sell in this type of venue (pop up events) as their norm. 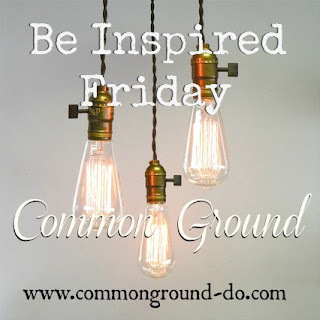 This is different from setting up in an established place, whether it's your home, an antique mall, or your own shop. 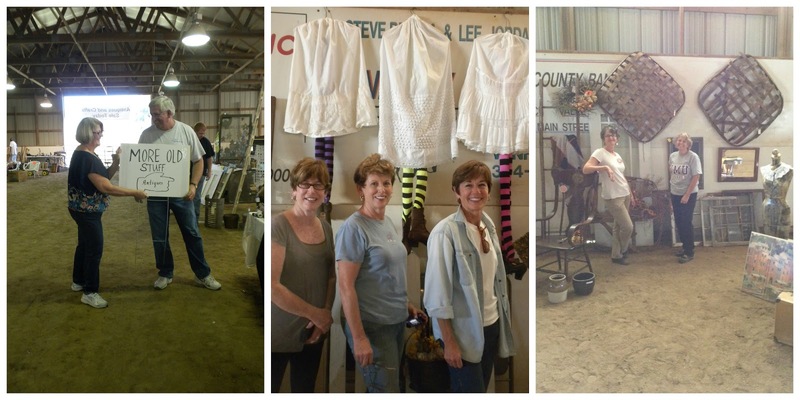 The labor of packing, pricing, loading/unloading/loading again, and cleaning (we were in a barn!) leaves me wanting to pay it forward and consider this when negotiating in the future. Be fair. Lesson #3: When you have markdowns, do it with separate signage, not on your tags. We packed several smalls, and had a good display rack for those items, Prior to the sale, we marked several items previously in our booth space down (on the tickets). On Day 2 of the sale, we marked some things down again. We learned by observing a well-respected couple who've been in this business a long time to make signs for the sale pricing instead. This way you can take your items back to your booth space and not have to start at the lowest marked price; otherwise, you'll need to make new tickets. Lesson #4: Displays matter. We received many compliments from both dealers and shoppers on our displays, which drew people into our space. It's actually one of those self-actualization things in Maslow's hierarchy of motivational needs that completes us (Panoply). 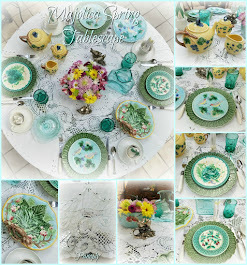 Yes, we love selling our items, and there's no denying for me, given that I am a business major, that I want a really good profit margin, but that is NOT what antiquing is about. I would never attempt or encourage anyone to make a living doing this type of business. 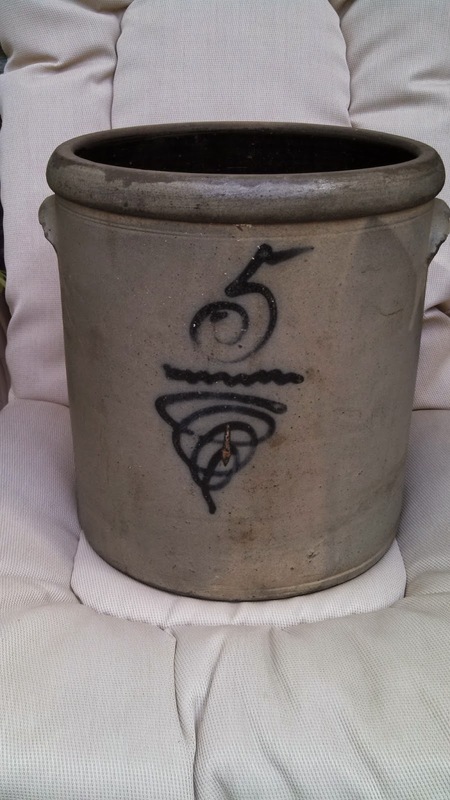 We engage in this hobby because we love buying, finding old and unique things, styling displays with them, and selling the items to those who enjoy them as much as we do. Lesson #4: Be yourself, and don't try to be anything but yourself. Doing this event in the barn was a good lesson for me. While I was comfortable with being immersed in the atmosphere (I am a very casual in my style), I have to admit, I did not enjoy the dirt. As soon as we started unloading, I knew I was going to have to REclean every.single.item.that.came.home. 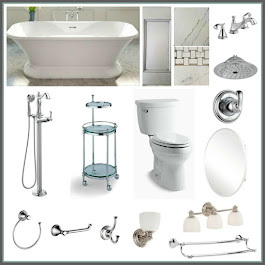 I admit it, I am a little big-time OCD when it comes to things being clean, probably more than I realized. There was no escaping the dirt, even if we had put tarps down, as the center path would have tracked dirt - a very fine dirt - into our space. Thank goodness it was dry, and not muddy. We dressed accordingly, and everything is now clean again, and put back in either the booth space at the mall, or in storage. 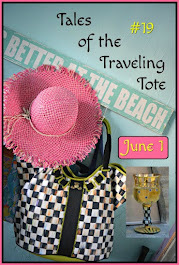 Lesson #5: You will, most likely, be hauling things back home, so be prepared. The photo below is our trailer, packed prior to the event. We came home with a load that reached the edge of the first set of wheels (see photo below), or about half of what we took. Disappointing, yes. 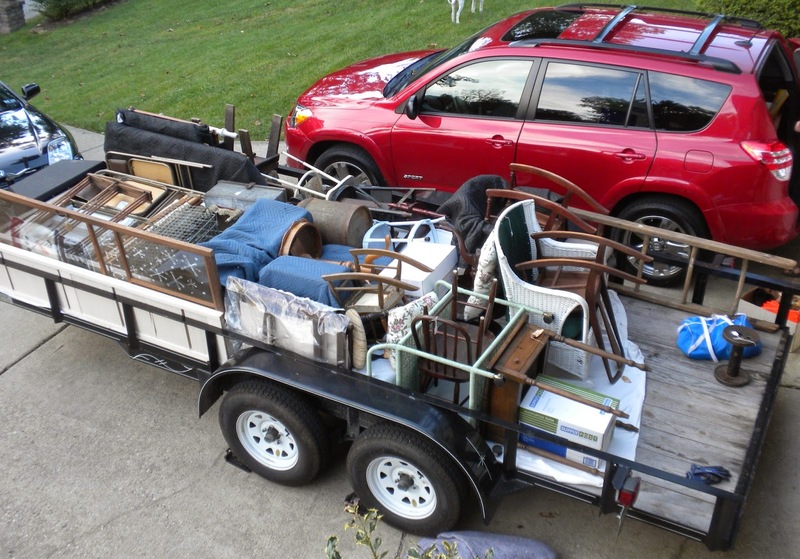 Our trailer haul, prior to the sale. We came home with roughly half of what we took. Lesson #6: You can never have too much advertising, but you can certainly not have enough. When you commit to doing a sale, know the plan for how it will be advertised by those sponsoring the event. 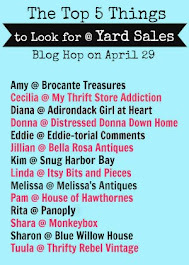 This event is in its third year, and our friends indicated the advertising in past years was not great by the sponsors, so we embarked on our own efforts, through Facebook, email lists of roughly 500 buyers, with cards at the antique mall, and word-of-mouth. It wasn't enough. So, my friends, I am happy the pain of this delivery is behind me, and now I am behind. 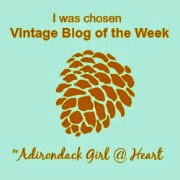 I am behind in laundry, reading my favorite blogs, magazines, and books, and taking care of personal business. 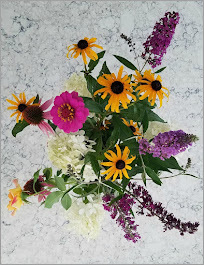 Thank you to all who have encouraged through comments on my Barn Sale Preview post, and I hope to catch up in the coming weeks, while taking a little break too. Just remind me, if I ever speak of doing something like this again, of the pain of delivery of this baby, okay? There are so many things to do and see in the Alexandria, VA area, not to mention the Washington, DC area, just minutes away, across the Potomac River. This post is a summary of a few more of the great sites in the historic Alexandria area, should you decide to plan a trip there in the future. 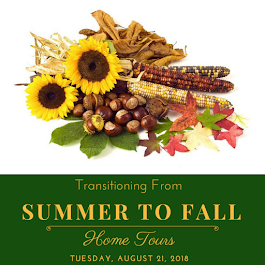 If you missed my previous posts on tours of the Stabler-Leadbeater Apothecary Museum and the Carlyle House Museum, links are provided at the end of this post. Alexandria is easily navigable by car, and once you're in the downtown area, it is easy to walk or bike to get around. Public transportation is also available, and some hotels provide shuttle service to and from various sites in the downtown area. At the water's edge of the Potomac River, Alexandria - Old Town Alexandria as it's often referred to - has revitalized its port area. 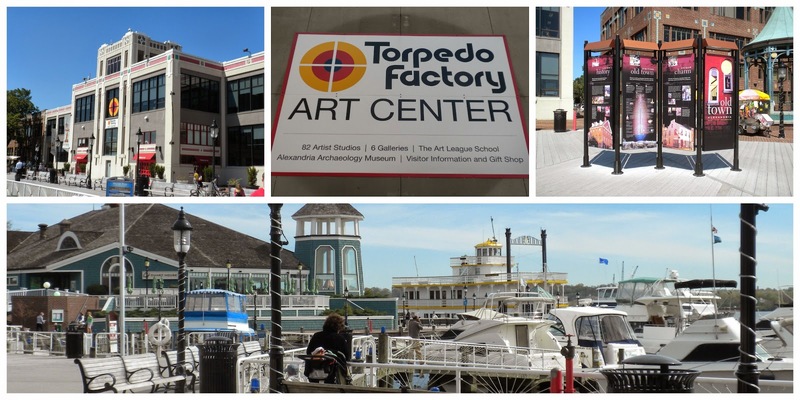 What was once a Torpedo Factory prior to and during WWII has now been morphed into a hub for arts and crafts workshop and retail areas of juried artisans. It is three floors of rich talent and wares. The port itself is the place to cruise to and from the town, back and forth to the DC areas of the National Mall and Georgetown. History is preserved within one area of the Torpedo Factory on third floor, well worth visiting. 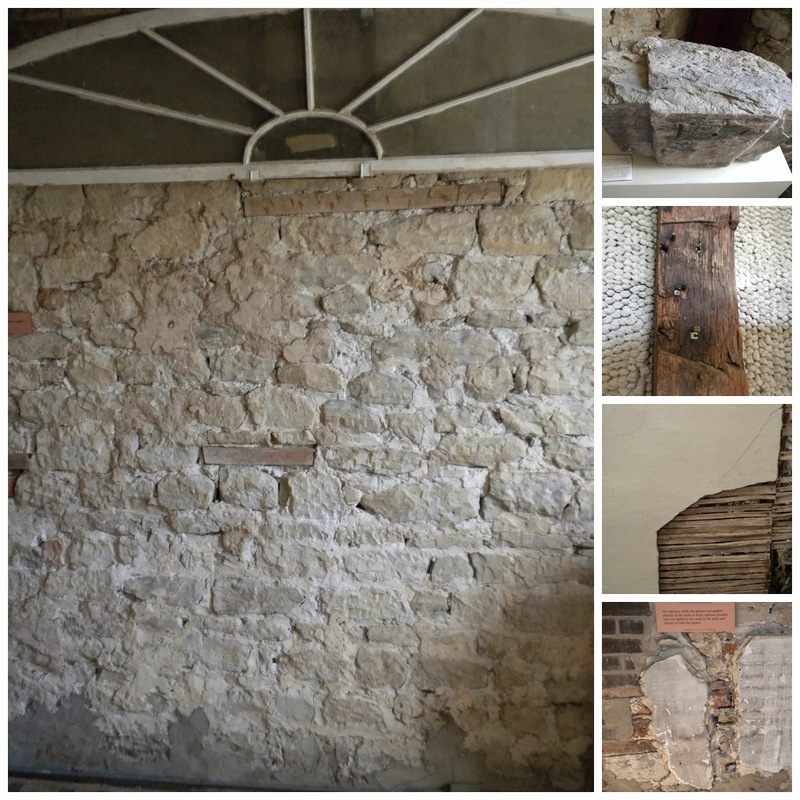 It is a room devoted to the articles found from archaeological digs that began in 1961 around the Lee Street Site area. 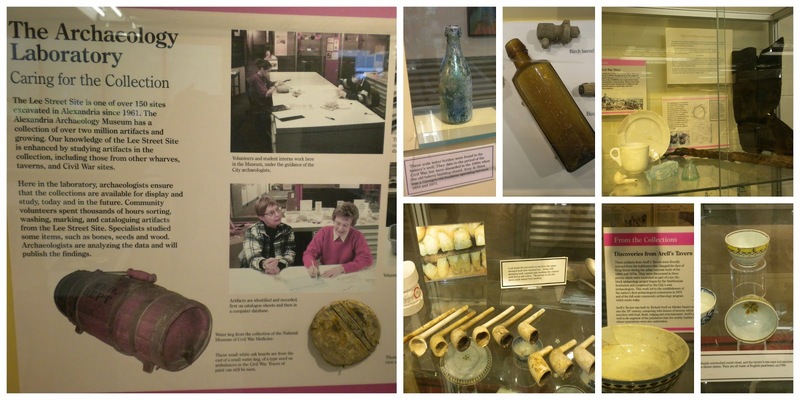 Over two million items have been found, and many are on display - from wharves, taverns and Civil War sites. There's even an interactive display table of broken china pieces, wherein you can put the plates back together. King Street is the main drag in Alexandria, with the municipal square near the middle of most activity, and across the street from the Visitors' Center. Walking through Alexandria is like walking through a royal court - you'll pass King, Queen, Prince, Duke Streets, as well as many other courtly titles along the way. The side streets of Alexandria are not to be missed! The town is also full of residences, in a brilliant display of urban renewal, co-existing alongside commercial sites. Everywhere you turn there is a courtyard of residential privacy, carved out of historical architecture from the past. The gates on these courtyards just beg for you to glimpse at what's behind them, as most of these residences are right along the street curbs. I snapped what I could without being too invasive. King Street in Alexandria is also home to several retail stores, among which is Anthropologie. Visual displays in this retail chain showcase regional creative genius, unique to each store. It is pure eye candy, and I love visiting, no matter what town it's in (we do not, unfortunately, have an Anthropologie in my town). 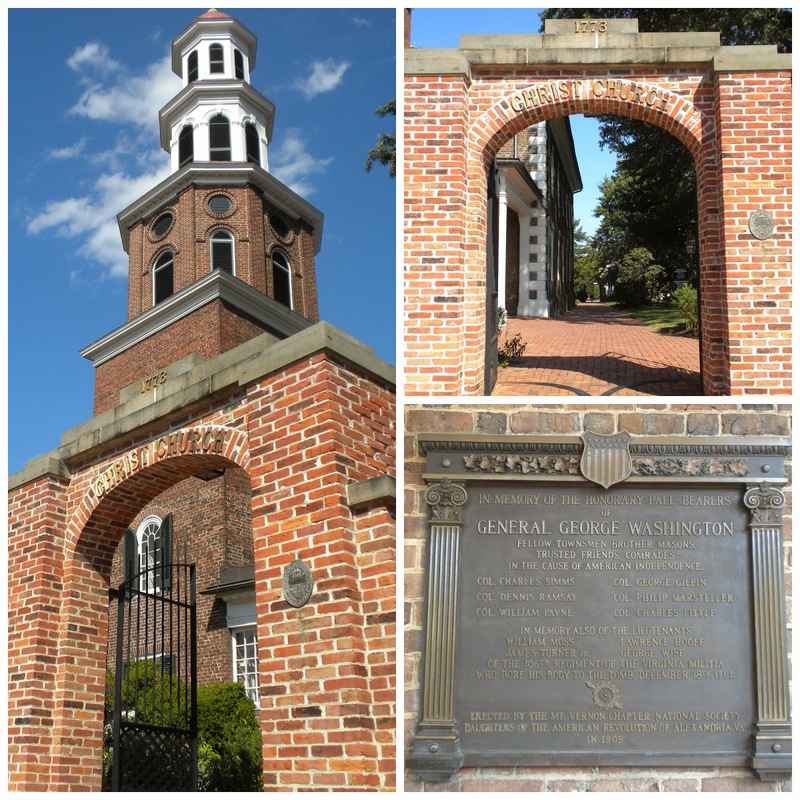 More history can be found when you step into the house of worship of Christ Church at 118 N. Washington Street, Alexandria. This Episcopal church was originally built by John Carlyle (the same merchant who built the Carlyle House), and finished in 1793. The church is designed in colonial style, and the interior is quaint. The exterior grounds include burial graves, including one mass grave commemorating prisoners of war who died during the Civil War. Many notable, historical people worshipped in this church. 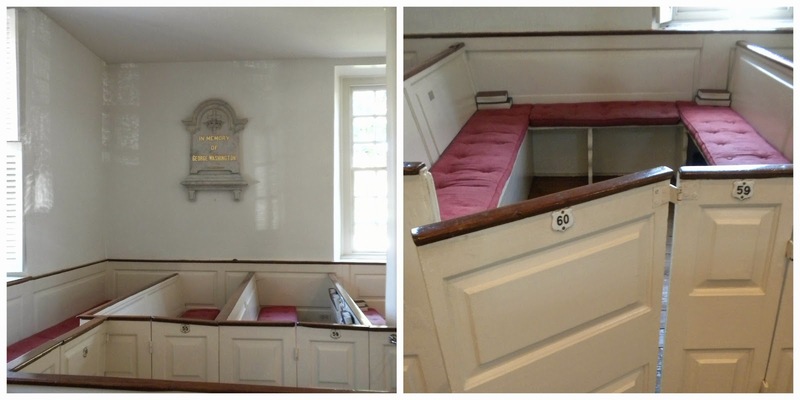 Pew number 60 is preserved as it would have been during the time in which George Washington's family worshipped here, in this same pew box. Other notable pews include number 46, which was reserved for Robert E. Lee's family. Today, the church has more than 2,400 members, and is open for tours without charge. The documents flanking the pulpit are original to the church's construction, yellowed with age. 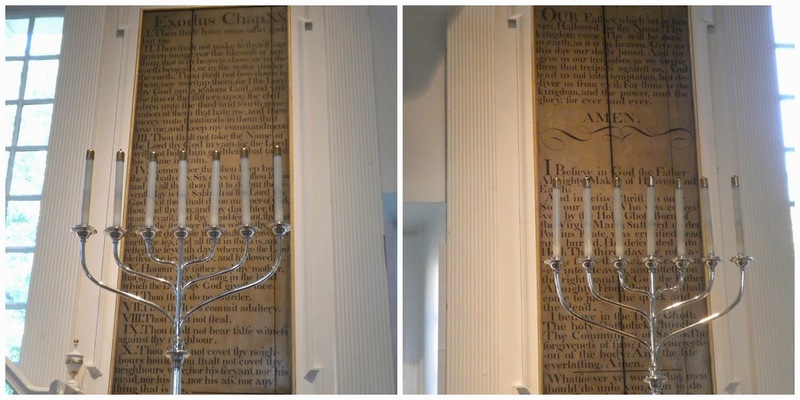 They are the Ten Commandments on the left, and the Lord's Prayer and Apostles' Creed on the right. Walking the streets of Alexandria brings about a deep sense of history and reverence in my opinion. 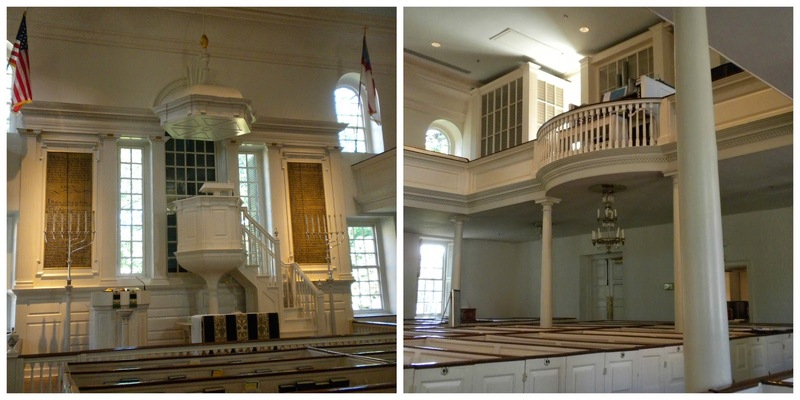 To be able to visit the church where George Washington worshipped (Christ Church), tour the home where the seeds of the Revolution were planted in his mind (Carlyle House), and enter the social realm (Gadsby's Tavern) where he, as well as the next four presidents' dined - all of these stir a genuine sense of the history building of America - all worth seeing. Without a doubt, one of the most notable sites for all things George Washington would include a visit to Mount Vernon, also in Alexandria. Although not part of this most recent trip, we have explored this wonderful home of Washington on a prior visit. So, in summary, Alexandria is a great place to go to unwind, have some fun, soak in a little (or a lot of) history, retail therapy and cultural activity. You never know where your path will lead! If you'd like to get more information on the town and its activities, may I suggest you use this link, The Alexandria Convention & Visitors Association, and explore the possibilities of your own visit. There's lots to explore! 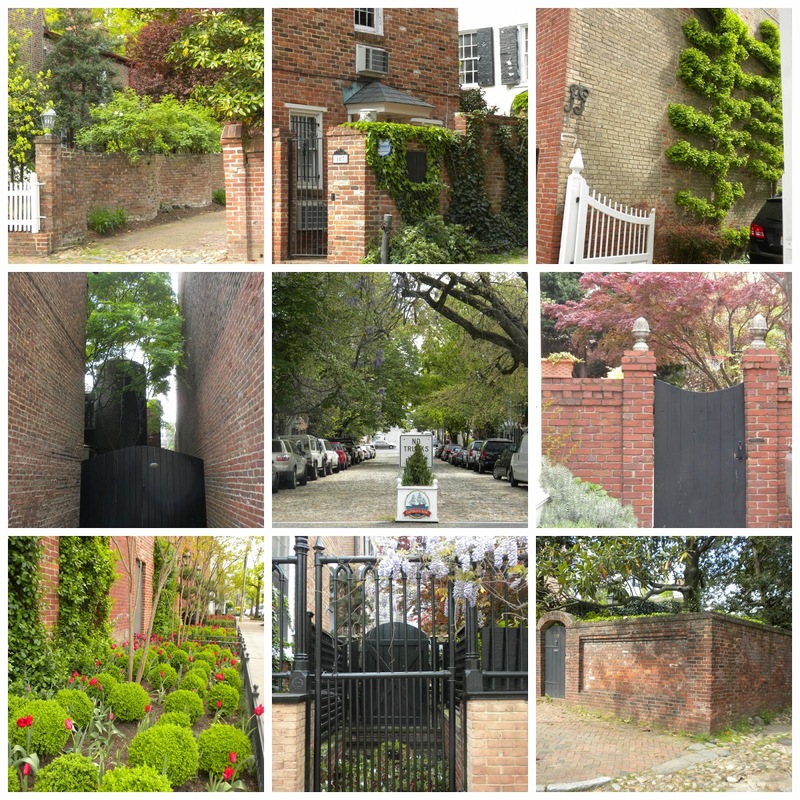 Visiting Old Town Alexandria - on the town! Welcoming fall has been a gradual approach for me, and continues to be. A couple of weeks ago I found large pumpkins priced under $5 each, potted mums (8") for $4, and so I grabbed a couple of each. My fern that's been on the porch is still thriving so, with a couple of heavy clay pots already on hand, I plunked my new pumpkins and mums on the porch and called it fall. Did I stop there? Nooooo. I knew I my fern would eventually wither, and I knew I wanted to pick up some baby boo pumpkins for a table centerpiece. I also knew I'd be putting some Indian corn on the porch, so off to the local farmers' market I went. To my pleasant surprise, I ran into my oldest daughter while there! Uh oh, we somehow were a bad influence on each other. We both went away with much more than either of us intended. 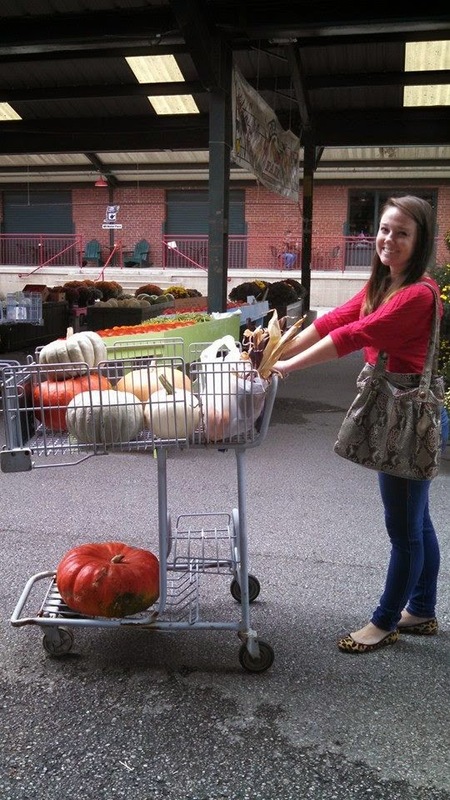 Once home, I immediately worked the opposite side of my porch with a tiered stack of pumpkins, each unique and different from those I previously purchased. So, I called it a day...er, rather a night. 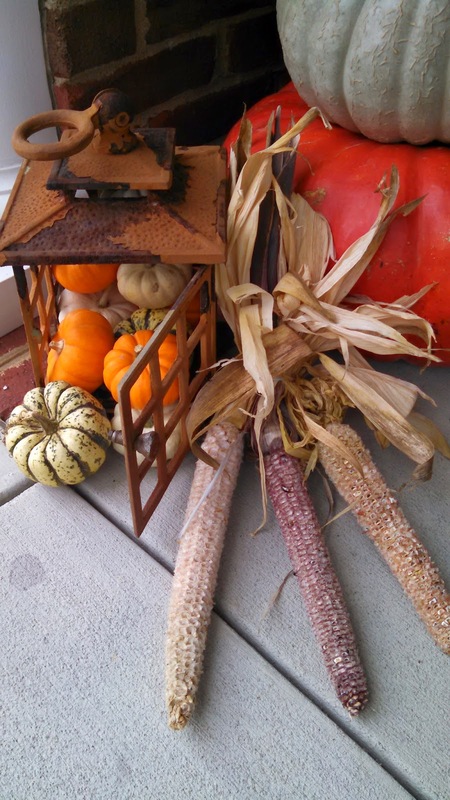 Simple, subtle fall porch display. Except I forgot the Indian corn, which I wanted on the left side with the tower. 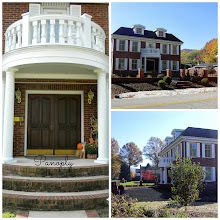 Porch balance - or not? But, I was leery of the basket getting soaked on the edge of the porch when the rain blows, so I opted for a cast iron candle lantern I had gotten years ago and left outside to weather. And that's how it ended - that day. I don't put wreaths on my doors other than at Christmastime. 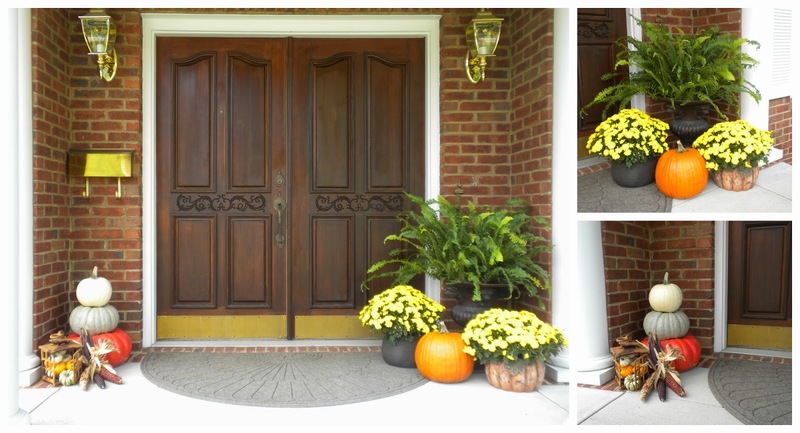 I like my front doors and don't really care for storing wreaths (you can see I would need two), and I generally keep things refined on the porch. When I do use wreaths, I use moleskin on the backsides to prevent the rub against the wood that damages the finish. Three days later, I got the stamp of approval for my front porch decor - from the squirrels. They started nibbling the cobs. It took them almost two weeks before they even discovered them last year. The squirrels leave their mess on the porch as thanks (they eat the hearts of each kernel and leave the remainder). I guess that's better than eating cable wires, which is what happened this past week. The cable guy actually found a squirrel's tooth in a severed wire, which caused me being off air for two days. Just another day in the life of bad squirrel decisions (BSD) - it's that time of year again, you know. 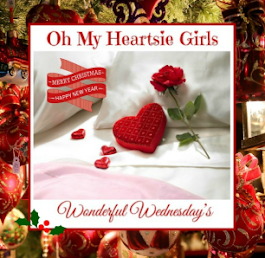 They cross streets without looking both ways, run across live wires, and chew into what they must think is hard candy in transformers and wires - all BSDs. Day 4 of Indian corn on porch - it was getting messy, especially in those crevices. Can you imagine if I had wreaths on my doors with Indian corn? I'd probably find Rocky swinging on the door as I opened it, unleashing my inner wild woman. Let's not go there. Day 6 - the cobs were completely raw and yes, I trashed them after I cleaned up the mess and took this photo. 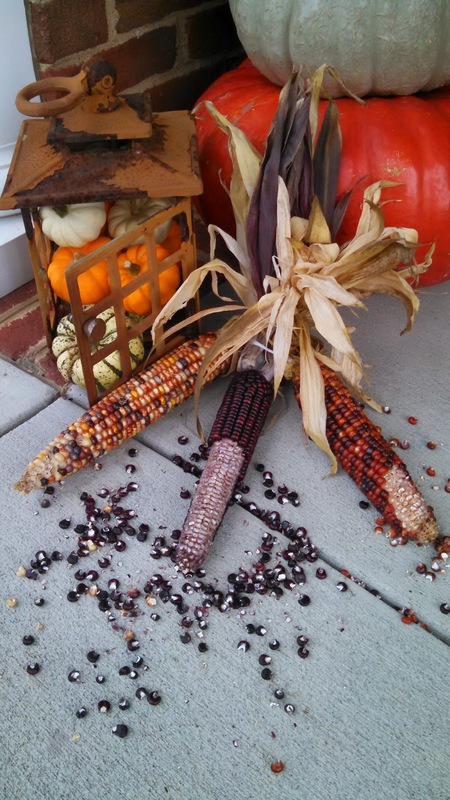 I don't think I'll replace the Indian corn on the porch, even though I have some miniatures for indoor decor. I was less amused by the hide and seek routine with the squirrels this year (blame it on the BSD of chewing into my cable line), but I was certainly less tolerant of the mess this year too. So, I'll just stick with my earlier statement of staying refined on the front porch, and go with a less is more attitude this year. Simple, subtle, fall. Happy Fall. During our recent trip to Alexandria, VA, a town full of rich US culture and fun, one of the historical tours we took advantage of was the Carlyle House Museum (1753). This Georgian Palladian manor house was established in 1753 by John Carlyle, a Scottish merchant. 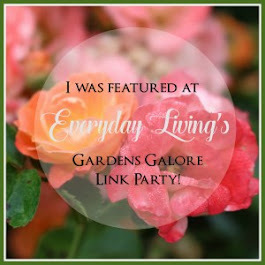 If you want a glimpse into Revolutionary Era elegance in both home and garden, this tour is for you! The Carlyle House is a fine example of what happens when an 18th century merchant agent settles in the Virginia Colony of North America, marries a resident rich man's daughter (Sarah Fairfax), and capitalizes on his assets (both land and servant purchases) in the new land of opportunity. Those calculated moves by John Carlyle resulted in building the most stately manor home in the most prime of locations in what would become the future United States. 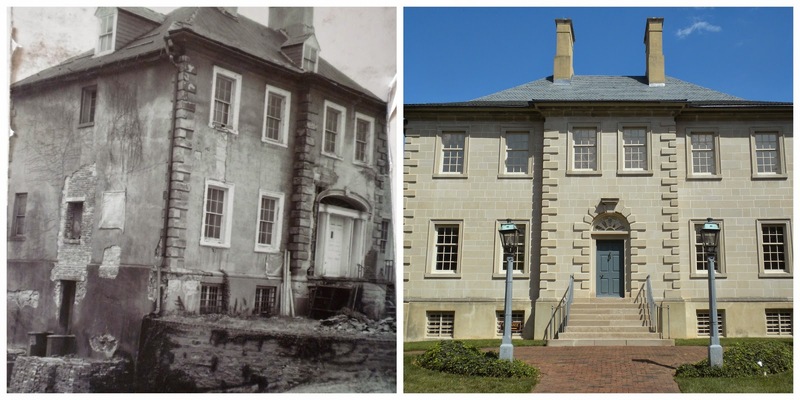 The Carlyle House was the first home built of stone, in a time when homes were only made of wood. 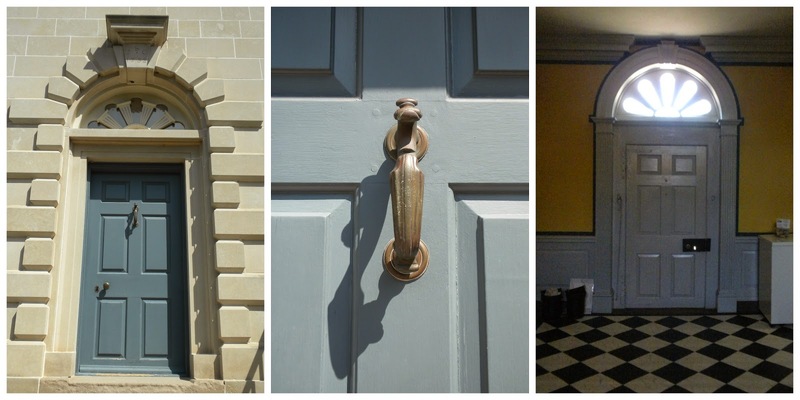 Entryway to the Carlyle House displays 18th Century vibrancy in its decor and color schemes. The "undertaker", as the greeter at the door was called, stands at back door of entryway. 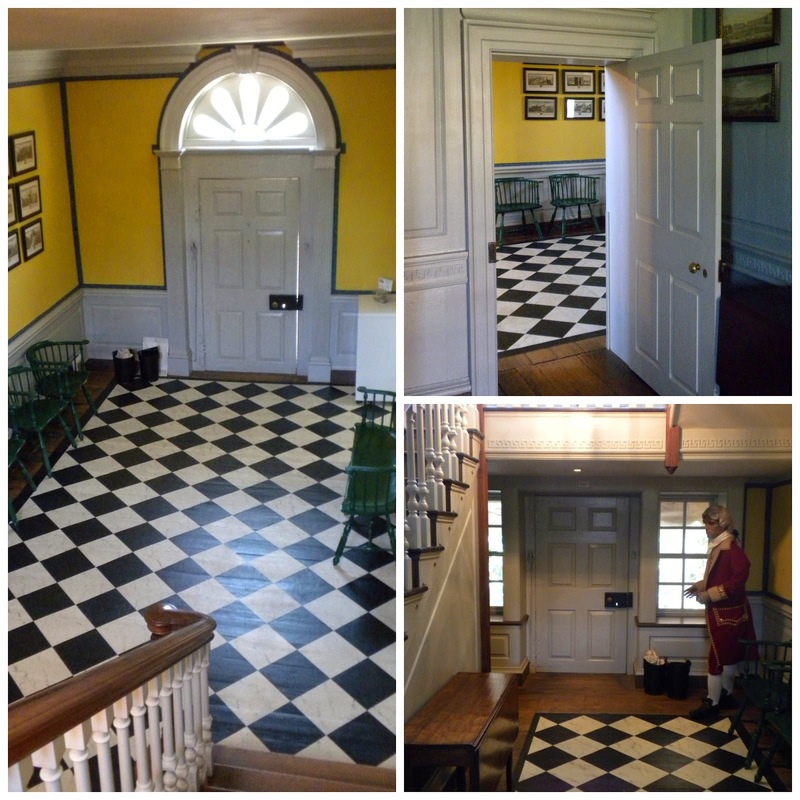 Notice the low height of the doorway as compared to today's standards. John Carlyle honored his family from Scotland throughout the building of both his life and home in the new colony. Letters sent were discovered in a country home in Scotland nearly 250 years after the home was built (now in the possession of the Virginia Historical Society). John's wife, Sarah Fairfax Carlyle, gave birth to their first child, a son (William Carlyle), on the eve of their move into the grand home in August, 1753. Parlor Room (adjacent to DR): Portrait of John Carlyle's brother (George) hangs above fireplace. Walls are covered in green enameled wallpaper. Valuables kept in closet (as in bedrooms). Map on right is from the family game room, showing the Virginia Colony being much of what is present-day eastern US. 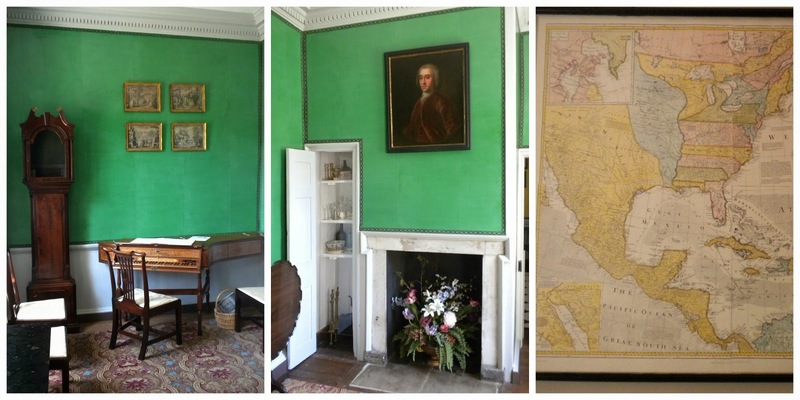 Portraits of John Carlyle's family are hung throughout the museum home - his mother Rachel in the master BR, father Dr, William Carlyle in the DR, brother George in the parlor, and one of John himself in the family game room. John was politically connected, and appointed major and commissary to the Virginia military forces during the French-Indian War (1754-1763). During this time, British Major-General Edward Braddock made the Carlyle House his headquarters. The Congress of Alexandria (the five established British colonies in North America) convened at the Carlyle House, headed by Braddock. George Washington, as a personal assistant to Braddock's field operations, was among those present. The Dining / Meeting Hall. 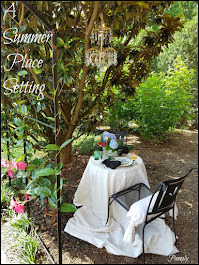 Mirrors were covered in cotton muslin during summer months to prevent insects from sticking to surfaces. Original period furniture. Portrait of Dr. William Carlyle, John's father, hangs above fireplace. Reproduction period clothing. It was in the dining room pictured above that the meetings held by Braddock convened, and where he planned an expedition to Ft. Duquesne (present-day Pittsburgh) that would result in his death in the French-Indian War. Second floor public passage space: central to the private hallways, this space served as a gathering area for map viewing, game playing, and afternoon tea (as staged here, with original furniture and serveware). While John acquired much prestige and wealth, he also suffered much tragedy, including the death of his first wife, and 7 of his 10 children. John Carlyle died in 1780 after a debilitating nervous breakdown and stressful career as military store keeper. 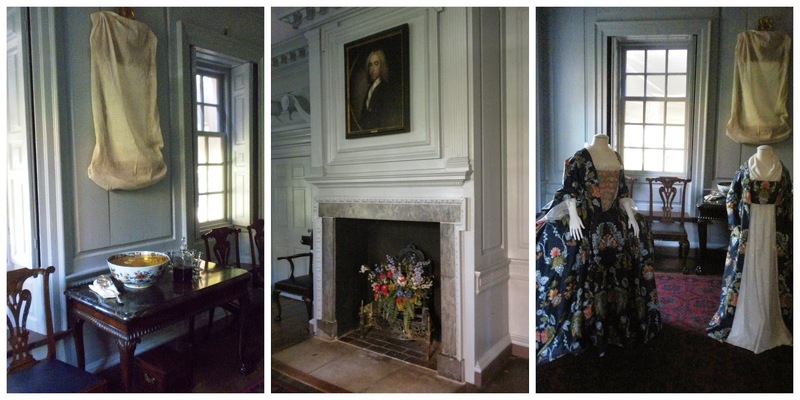 Master BR: original furniture (bedding, walls fashioned with period reproduction textiles, paper), portrait of John Carlyle's mother, Rachel, hangs above fireplace. Closets held valuables, including books and china. John's only living son, George William, inherited the house at the young age of 14. Sadly, he lost his life one year later (1781) in a Revolutionary battle in present-day South Carolina. 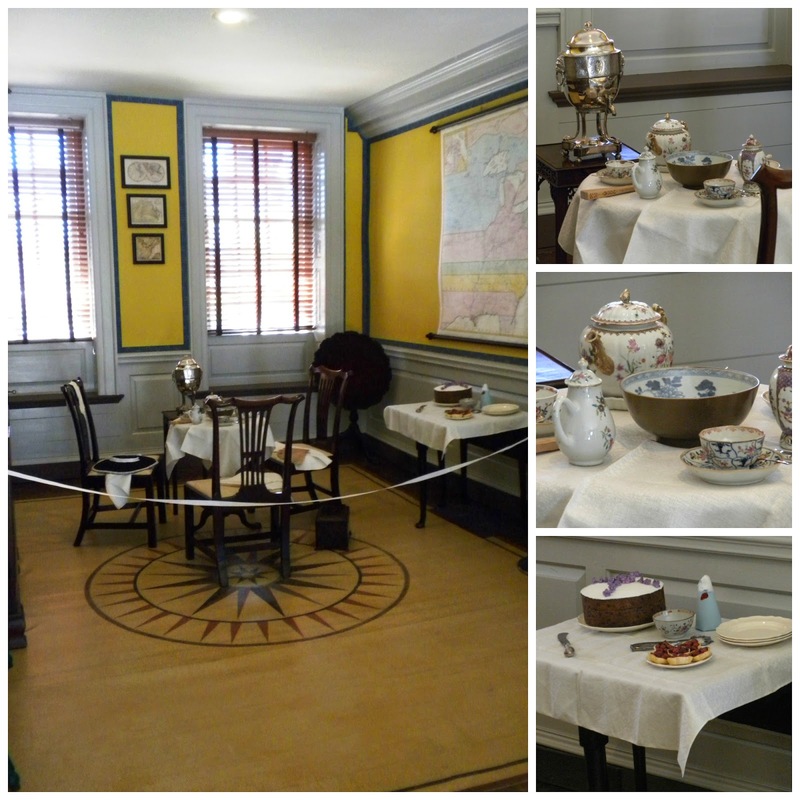 George William Carlyle's bedroom, with artifacts relevant to a young man's position at the time: bed, desk, dressing table, and facsimile of uniform worn in Revolutionary War. In 1781, Carlyle House was inherited by John Carlyle's grandson (John Carlyle Herbert) through his daughter Sarah Carlyle Herbert. When Sarah died in 1827, the house passed from the family's possession. Servants' importance: servants assisted in maintaining the home and its residents in everything from home construction and repair, cooking, serving, cleaning & laundering, dressing and mending. During the mid 19th century, the Carlyle House began its demise, as the Mansion House Hotel was built on Fairfax Street, completely blocking the view of the Carlyle House from the street. During the Civil War, both were seized by Union forces. During the early 1970s, significant efforts to restore Carlyle House were undertaken, and the Mansion House Hotel (also called the Braddock Hotel) was demolished as part of those efforts. Today, the house serves as a museum, preserving the rich history during a time in which the making of our great nation was in the embryonic phase. 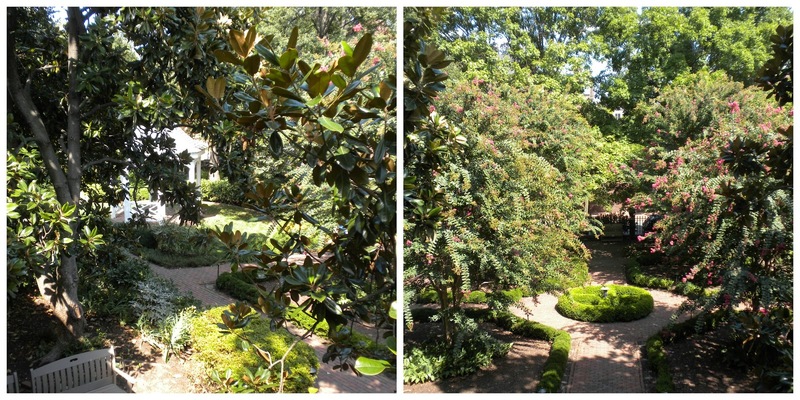 The gardens, as viewed from the first floor house terrace. In photo on left, a small gazebo is centrally camouflaged among the magnolia branches. Photo on right shows hardscape design., extending toward next city block. 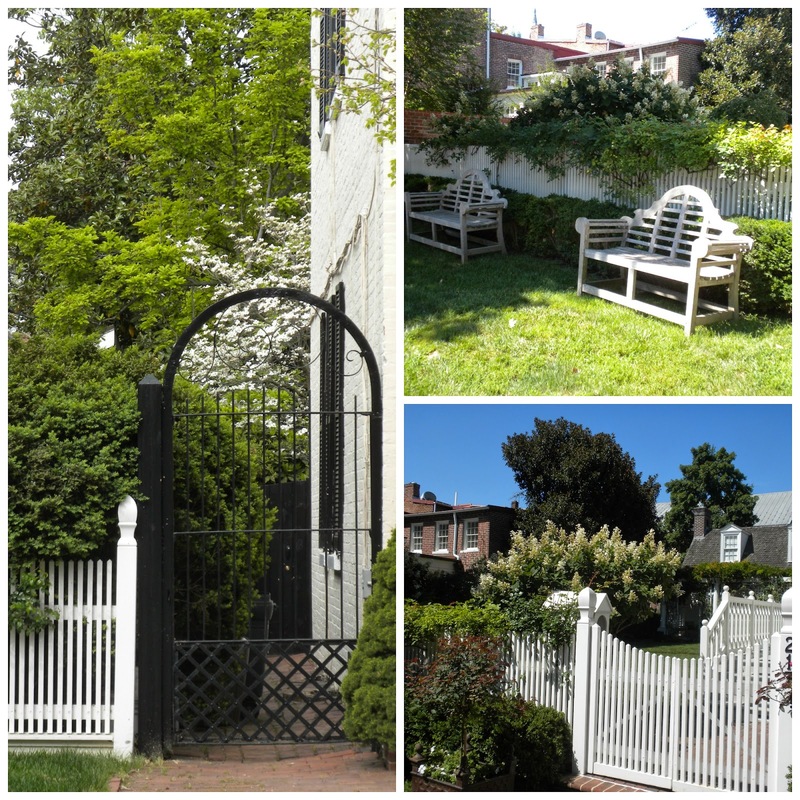 The Carlyle House is located at 121 N. Fairfax Street, Alexandria, VA 22314 (Phone: 703.549.2997). The museum tour does have a published schedule and entry fee, but there is quite a savings if you purchase a museum pass for $10 if you visit Alexandria and plan on at least two of the nine (9) historic sites in the city. More information can be found on the link provided. 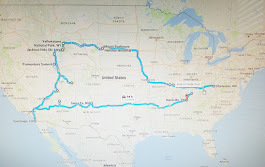 I was not compensated for writing this post; however, I did win a trip (via random drawing) to the town from The Alexandria Convention & Visitors Association, which included a "Key to the City" museum passes. All opinions and photos are my own. Last week I started working in earnest to get things ready for the barn sale which my sisters and I will be participating in at the end of the month. 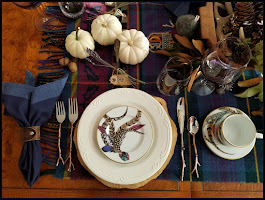 To that end, I set up a few vignettes in my basement to take some photos. A few days later, I went to sister M's house and we staged several more displays. The hope is to generate some local interest by posting some photos on a new Facebook page a few of us vendors are collaborating on prior to the sale. I thought I'd share the photos of what we've been working on. All of these items will be for sale. Lots of photos! Since we'll be in a barn, an equestrian vignette should be appropriate, if not expected. Clubhouse leather tags & helmet, driftwood horse head, trophies & medals, and solid brass & cast iron fireplace damper hook. The Doctor is in, 1960s style, a la American Horror Story: Asylum - creepy in a good way, I hope. Chair, sign, doctor bag and accordion style swing tray. Without going into detail, you should've seen the stuff in that doctor bag! Although lighting is bad here, these are a couple of light & chippy pieces set aside for the sale, next to the slag glass lamp. 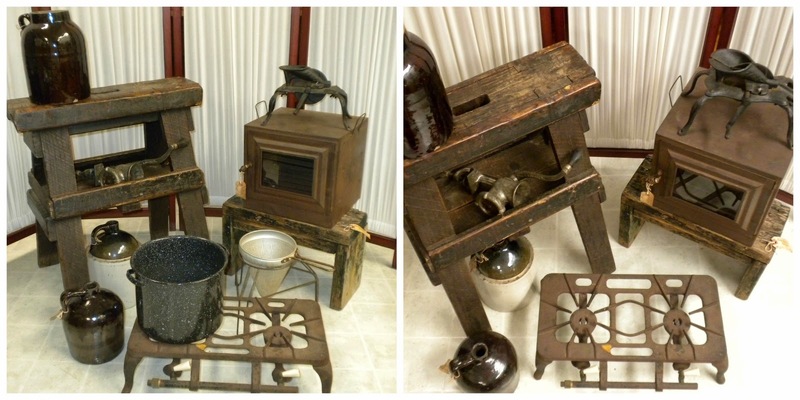 We'll have other primitives, as well as vintage linens, with these (below) as just a sampling. Seeing as sister J loves chairs, we'll have plenty of those, too. Chairs call for tables and lamps, right? Well, we've got those, too! 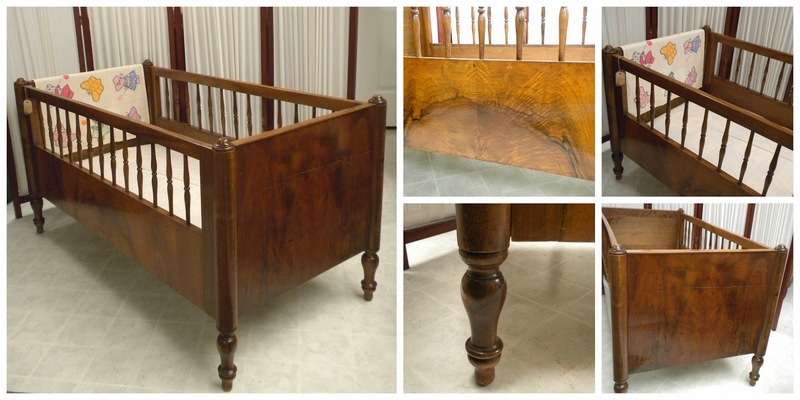 Coordinating with several children's chairs, we have this antique wooden baby bed that could make a terrific upcycled bench. Remember these from my post in July? They're all cleaned up now, and ready to go to the barn sale. We'll decorate them for one of the holidays (yet to be determined) and, hopefully, make them irresistible to someone. We'll also have an outdoor set up for camping, complete with picnic, sleeping and recreation. 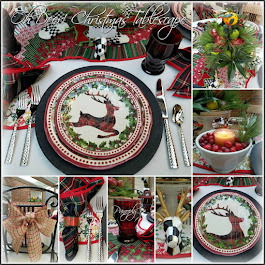 We also plan to have several holiday items, big and small. It'll be a busy time as we gather items and set up for the sale, which is September 26-27 (Winfield, WV). I probably won't be taking photos of all the smalls until we get set up in the barn. Hopefully, I'll remember to get photos before it gets rummaged through at the sale. We hope to have traffic enough that it gets rummaged. Whether the Facebook page will continue beyond the barn sale remains to be seen, waiting to see how this little marketing effort goes. All of the vendors involved are situated in our local antique mall, so we may use the page after the sale to promote our booth spaces. For all you dealer friends out there - what's your favorite venue for selling? On the flip side, what's your favorite venue for shopping? I'm interested in your thoughts, as each one has its pluses and minuses, whether selling or shopping. Online, in a booth space, pop-up sale, flea market/yard sale, or brick and mortar stand-alone store - which venue do you prefer to sell in and why? 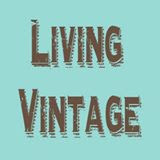 For those who aren't dealers, what's your favorite way of shopping for vintage and antique items and why?